The STX August bull call spread (long 11 short 15) expired worthless for a loss of -3.00. The short August 36 GILD calls expired worthless for a gain of +2.03. The short August 18 BAC calls expired worthless for a gain of +1.51. Back on August 8 the short AEP August 34 covered calls were assigned, resulting in a total gain on the position of +1.00. While waiting for the North High Street bus in Columbus, Ohio in 1976 I met Wally Michener (now K0TSI in Golden, Colorado) who, like me, was studying engineering at Ohio State. During the course of one of our bus rides the subject of ham radio came up. I told him I had been interested in the hobby for years, but never had an Elmer to help me get over the hump. As luck would have it, Wally became the greatest Elmer one could ever hope to have. On September 28, 1976 I was issued a Technician license with callsign WD8CXY. With a homebrew 80-meter CW transmitter and a Yaesu receiver, I made some HF contacts from Columbus using a simple random wire. But, my amateur radio career really didn’t start in earnest until I graduated from OSU and relocated to Lexington, Kentucky in the summer of 1977. I became WD4LWH and operated from a small apartment on the city’s east side. I passed the Advanced class test in 1978. 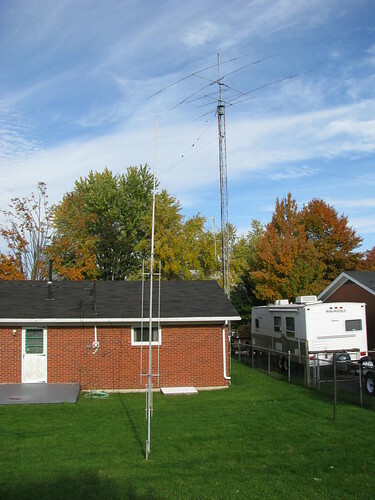 In March of 1979 I moved into my present QTH, and after erecting some decent antennas I got pretty deep into our wonderful hobby. After passing the Extra class test in December of 1979, I was issued the call sign KU4A in January, 1980, via normal sequential issue. I am active on most all bands and most all modes. My present primary home QTH equipment is a Kenwood TS-2000 for SSB and CW, and an Icom IC-746PRO used exclusively for digital modes. I have never owned an amplifier. If I can’t work you with 100 watts, we will have to wait until band conditions are better :-). My HF mobile setup is an old Icom IC-706 with an SGC-230 automatic antenna coupler and SGC-303 whip. I began collecting vintage gear several years ago, and this house is filling up fast. I’ve achieved 5-band W.A.S., DXCC and numerous other awards. I do a lot of contesting. While not a big gun, I have pulled out a few state/section level victories. I am the current record holder in the mixed-mode QRP category in the ARRL Ten-meter contest for the Kentucky section. My interest in award chasing has been enhanced by the willingness of so many hams to QSL. So, obviously, I myself QSL 100% either direct or via the bureau since I want to help you earn your awards. An SASE is appreciated but not absolutely necessary. I have had lots of problems with LoTW so I am not using it presently. That will change sometime in the future. If you need Kentucky or Fayette County Kentucky don’t hesitate to drop me an e-mail and we will see if we can set up a schedule.